The 8” high alternating pressure relief replacement system are designed for the mid- to long-term, heavier weight patients, and the mattress cells are 8 inch high, this allows the patient to sink deeper into the mattress surface. 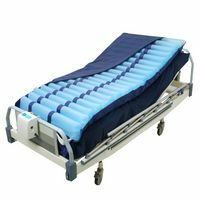 To meet different patients’ need, the mattresses are equipped with the Pillow Function. CPR valve. Quick connector and transport which is added more Comfort. The vapor permeable, 4-way stretch cover can shear force and has a wipe clean surface. It’s Waterproof and fire retardant. The cover also has a zip on three sides for easy inspection or removal. Alternating. Static and Auto Firm function. Therapy up to Stage IV pressure ulcers. Patient weight adjustable from 40 to 200 KG. Easy operation and offer a great Comfort. Pump: Audio & video indicator for Power Failure. Low pressure.